This is a much-expanded version of our previously-published essay on P. R. Stephensen. Percy Reginald “Inky” Stephensen (1901–1965), was one of Australia’s pre-eminent “men of letters,” or “Australia’s wild man of letters” as one biographer referred to him. He also served as a ghostwriter of many books and as a mentor to aspiring writers. 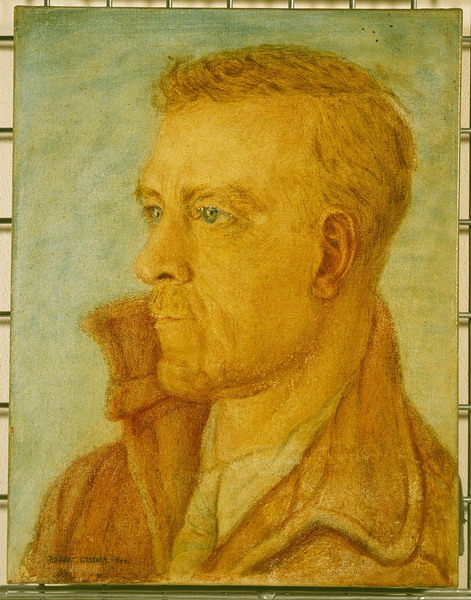 Like his New Zealand contemporaries such as A. R. D. Fairburn, Stephensen sought to develop a distinct national culture for his homeland. His work as a publisher and political activist was dedicated to fostering this sense of “Australianity.” Like many others of the “Right,” such as Ezra Pound, Roy Campbell, and Knut Hamsun, Stephensen has often been unacknowledged despite his pivotal role in developing an Australian literature and defining an Australian culture. Born in Queensland in 1901 of Scandinavian descent, Stephensen had a polemical disposition from an early age and was inclined towards the Left as a university student. In 1921 he was a founding member of the Australian Communist Party. After graduating in the arts he took a teaching position in 1922 and formed a Communist association. He was also one of the first to write an in-depth review of D. H. Lawrence’s novel Kangaroo, while serving as a writer for a Labour Party newspaper in Brisbane, The Daily Standard. Several years later in England he became Lawrence’s publisher. In 1924 he was selected as Queensland’s Rhodes Scholar and enrolled in the School of Philosophy and Political Economics at Oxford. He was one of the few members of the Communist Party at Oxford and was active in spreading propaganda in support of Indian independence. Despite qualifying for his Bachelor’s Degree in 1927 he never bothered collecting it. An Australian nationalist only obtained documentation of his studies in 2000. Whatever Stephensen’s ideological commitment to Communism, it seems likely that his motivation was a reaction against bourgeois society. As the publisher of the London Aphrodite during the late 1920s, Stephensen wrote an article in praise of the Russian anarchist leader Bakunin with particular attention to him as a man of pure action and vitality. Stephensen’s admiration was based on his view of Bakunin as a Nietzschean-style figure. Stephensen describes Bakunin as what Nietzsche would have termed “Higher Man” as the forerunner of the “Over-Man,” although it is doubtful whether Nietzsche himself would have applauded Bakunin’s anarchism: “Only one man has lived dangerously—Michael Bakunin. While Nietzsche postulated the Fore-runner, here was a fore-runner in deed . . . ,” wrote Stephensen. This man, Bakunin, walked on the edge of precipices, and is a hero. I have little difficulty in preferring his character to that of, say, the much-esteemed Mr. Stanley Baldwin, whose inane posture of “Safety First” has actually been employed as a sedative to voters in the recent dull Elections in Britain. The Bakunin-principle of action was always “Safety-Last.” Bakunin is essentially revolutionary, the antithesis of Baldwin. His type is surely not extinct. It must re-emerge, stronger, or the world dies. Stephensen’s polemic against Christianity was also a Nietzchean-revolutionary synthesis, expressed in a poem entitled “Holy Smoke.” He challenges God to perform a miracle to make believers of an unbelieving age. Abandon us in your abstract Kingdom of Heaven! The devil is beyond temptation, being a Bolshevik . . .
To follow the Golden Rule, or the Rule of Gold . . . Returning a stronger blow for each blow received! And failing a rescue, let us die with a curse . . . This aversion to Christianity is not noticeable in Stephensen’s later political activities and writings in Australia, although it is reasonable to think that it helped form a basis for co-operation between Stephensen and the Sydney businessman W. J. Miles, a prominent Rationalist who funded Stephensen’s cultural and political nationalism, including the founding of The Publicist. In 1927 Stephensen took over the Fanfrolico Press which specialized in limited editions, along with the literary journal, the London Aphrodite. He went on to establish the Mandrake Press and published a volume of paintings by D. H. Lawrence, Lawrence’s Apropos of Lady Chatterley’s Lover, and a volume of Lawrence’s poems, Pansies. Stephensen also helped to publish an underground edition of Lawrence’s Lady Chatterley’s Lover, which was the first edition to be printed in England. Stephensen’s innate rebelliousness is also displayed by his having written and published a biography of the infamous occultist, poet, and author Aleister Crowley, whom the sensationalist press at the time was describing as “the wickedest man in the world,” “The King of Depravity,” and “A Man We’d Like to Hang.” Stephensen had no interest in occultism or mysticism per se, and as with his support for D. H. Lawrence, his work on Crowley was probably motivated by latter’s affront to bourgeois society. Crowley’s Nietzschean-style polemics against Christianity would also have appealed to Stephensen. Israel Regardie, Crowley’s secretary at the time and a life-long devotee, wrote years later in the “Introduction” to Stephensen’s biography of Crowley that Stephensen and his wife, a classical ballerina, were “very charming and kind people. . . . Inky’s interest in Aleister Crowley was wholly literary. He had a good grounding in philosophy, but cared absolutely nothing for the occult.” Stephensen, for his part, regarded Crowley as a literary “genius.” Considering the furor around Crowley at the time, it is indicative of Stephensen’s disregard of conformity, which would re-emerge in his political activities when the Axis was widely perceived evil incarnate. Stephensen’s Mandrake Press also published Crowley’s novels Moonchild and The Stratagem, and the first two volumes of a projected six-volume Confessions of Aleister Crowley, the third volume of which never got as far as proofreading. Stephensen wrote the biography in order to try and thwart the damage being done to the sales of Crowley’s books due to bad media publicity about Crowley’s character, which was hardly helped by the self-styled “Great Beast’s” cultivation of notoriety. However, the biography did not sell well, The Confessions was boycotted by booksellers,  and Mandrake Press was liquidated. In July 1935 Stephensen published The Foundations of Culture in Australia: An Essay Towards National Self Respect. It is a vigorous call for an Australian national culture, which has remained influential among literary circles although seldom acknowledged as such. It is culture that provides “permanence” for a nation while all else moves on. Culture transcends “modernism” and the ephemeral nature of politics, society, and economics. Race and Place are the two permanent elements in a culture, and Place, I think, is even more important than Race in giving that culture its direction. When races migrate, taking their culture with them, to a new Place, the culture becomes modified. It is the spirit of a Place that ultimately gives any human culture its distinctiveness. Landscape painting in Australia, however, was never based on a journalistic element. Landscape painters had to examine Australia carefully, expressing “the Spirit of the Place,” the strange contours of the land, the solitude, and the light quality of the atmosphere that symbolize most purely what is Australian. Australian painters were also dependent upon a national audience and market, not a world market where art is prostituted for money. The painting is individual while the book is mass produced. Despite the universalizing tendencies at work, Australia had the right to become a nation, but there cannot be a nation without “a national place idea, a national culture.” Stephensen’s view of culture being “national” rather than “universal” was widely held by the culture-bearing strata throughout the world and is strictly analogous to the sentiments of Rex Fairburn in New Zealand, in response to the communist fad among many contemporaries. Stephensen attacks those academics who sought to demean Australia as a nation and as a culture by forever subordinating Australia to Britain and to the British Empire. He acknowledges that it is the English culture from which Australian culture will proceed, but it was the plant that would grow, rather than the English fertilizer that would now be of concern. Culture is the essence of nationality, the nation, an extension of the individuals that comprise it, “generation after generation.” Nationality gives the individual a sense of pride and meaning. History is the tale of waxing and waning empires. All empires have waxed before waning. Britain’s Empire has waxed—will it now wane? Yes, inevitably. An empire is no more permanent than an oak-tree: the mightiest oak must fall, rotting hollow at the core. Everything that has life in it has death in it, too. A moment of rapture, or a moment of power, cannot be prolonged unduly beyond its zenith. Where there has been strength and greatness, there must come sequent decline and fall. Without deaths, there would be no births. Death is necessary, to make way for more life. Old empires, old cultures, must crash—and Britain’s Empire with them—to make way for new empires, new cultures. Who would have it otherwise? Only those who object to death’s inevitability and to time’s changes! Let them object—the objection is noted—and history’s blind processes go on. Although Muirden for reasons unknown states that Foundations “was probably to be the final public statement as a liberal,” and although Stephensen was even then referring to Fascism as more a danger to Australia than Bolshevism, which he regarded as “at least [having] a humanitarian goal,” ever could be, Foundations is unmistakably of the “Right,” with is emphasis on the “spirit of race and place,” that has no association with the Left let alone with “liberalism.” This Rightist orientation was soon to be reflected in Stephensen’s new political associations, which he maintained for the rest of his life. In 1935 a wealthy businessmen, W. J. Miles, whose World War I activities included opposition to conscription and advocating the concept of “Australia First,” contacted Stephensen after reading Foundations. Together they launched a magazine, The Publicist. The journal lasted until 1942. It was described as “the paper loyal to Australia First.” Miles was in editorial control. His views were overtly pro-Axis. German, Italian, and Japanese propaganda material was sold at the Publicist offices. A free hand for Japan in China was supported at a time when the Left was calling for a boycott of Japan. Stephensen viewed Japan as “the only country in the world completely free of international Jew Finance.” He believed that there would be a world war involving Australia within a few years. He saw no advantage to Australia in sending her men to spill their blood in Europe. Many Australians remembered the huge losses suffered during World War I caused partly by the unrealistic orders of British commanders. Despite the radical tone of Miles and Stephensen, The Publicist attracted a number of prominent cultural figures, such as Ian Mudie and Rex Ingamells, who wrote on the arts. It also offered a generous amount of space for right of reply to its enemies. Between 1936 and 1937 The Publicist started putting forward broad points of policy for the establishment of an Australia First Party. In 1938 readers’ groups suggested a twelve-point program as a basis for discussion. The principal group was the Yabber Club in Sydney, whose attendees included Mudie. When war was declared, the Australian authorities began to scrutinize the Yabber Club, but their informants could find nothing sinister about it. In the September issue of The Publicist, Stephensen stated that he had campaigned for peace with Germany, since any war Australia fought should be for Australian rather than Jewish interests. The Publicist was now subjected to wartime censorship and paper restrictions. However, only one article, and not one by Stephensen, was ever blocked by the authorities, which indicates that The Publicist was not considered subversive by the censorship board. Naturally, the Left was not so charitable and referred to The Publicist as the center of a “Nazi Underworld,” although the position of the Communists at this stage of the war was hardly intended to be helpful to the Allies. While the pro-Germany sentiments had to be toned down during 1940, The Publicist maintained its friendly attitude towards Japan. Once Australia was engaged in the war with Japan, the journal opposed any defeatist tendencies but continued to advocate home defense rather than sending Australian troops far afield, and the right to negotiate independently and sue for a separate peace. After several years of tentative activities Stephensen formed the Australia First Movement in September 1941. A major element in the formation of the movement was the Sydney Women’s Guild of Empire, formerly antagonistic towards The Publicist due to the issue of loyalty to Britain. The mainstay of the Guild was Adele Pankhurst Walsh of the British suffragette family. On migrating to Australia she had married the militant Seamen’s Union organizer Tom Walsh in 1917. Both became founding members of the Australian Communist Party. Breaking with communism, Tom joined and lectured for the “New Guard” and was outspokenly pro-Japanese. A ten-point manifesto was adopted, superseding Stephensen’s more radical manifesto of 1940. The movement demanded recall of Australian troops from overseas, independent action in diplomacy, and the removal of American influence. A number of public meetings involved some hecklers. However, a meeting in February 1942, which had an audience of around 300, erupted into what the press termed “one of the worst brawls ever to occur in a Sydney public hall.” Half the audience was antagonistic, and Stephensen in particular was met with opposition. He was hit over the head with a water carafe, knocked to the floor, and kicked by a group. The police were slow to respond. However, once order was established, Stephensen continued with the meeting despite his beating and continuing interjections. Stephensen addressed the meeting for around 80 minutes. He demanded that American troops in Australia be subject to Australian command and stated that they should be there to protect Australia, not to further other American objectives. On orders from the Attorney General Dr. Evatt, Australia First was prevented from holding further public meetings by the police. A crowd of 3000 showed up to listen to Stephensen only to find the meeting canceled by government directive. 6. For national socialism; against international communism. 14. For higher birth-rate; against immigration. 15. For “White” Australia; against heterogeneity. 16. For Aryanism; against Semitism. 35. For women in the home; against women in industry. On August 1, 1941 under the heading “Towards a New Order,” it was stated that these were principles, not planks, for a democratic parliamentary party. The article was an explication of the Fifty-Point program of May 1940. “Our self-imposed task was to throw a stone into the stagnant pond of Australian political complacency,” Stephensen writes in the preamble. Stephensen states that the war gave birth to the need for forms of government other than democracy, despite the war supposedly being fought for democracy. The war aims made redundant sectional interests in the service of the common interest. This perception had formed the basis of fascist movements after World War I among many returned servicemen, in what Mosley called “the socialism of the trenches,” a camaraderie of soldiers that many held should be brought over in to peacetime civil life. The aftermath of World War II however, did not see another revival of that spirit for reasons that cannot detain us here. Stephensen considers a declining birth rate a symptom of decadence which would lead to the extinction of Australia, especially when there were suggestions to make up for the population shortfall through immigration, one of the panaceas for demographic decline that is now routinely touted by politicians in Australia and New Zealand. He called for a white Australia as a “biological aim” to create a permanent home for persons of “European racial derivation.” This would exclude “Semites” and other non-absorbable immigrants. However, Stephensen’s championship of “Aryanism” cannot be dismissed as simple racial supremacism. Stephensen was an avid supporter of Aborigine rights, serving as secretary of the Aborigines’ Citizenship Committee, which supported the Aborigines’ Progressive Association comprised of an Aborigine only membership. The Abo Call was a magazine that sold in the Publicist office alongside the Axis journals. Stephensen helped Aborigines organize the “Aborigine’s Day of Mourning” on January 26, 1939, the 150th anniversary of the “founding of Australia.” The sympathy of Australian nationalists with the Aborigine, decades before the issue became a cliché for liberals and “progressives” of all types, was seen by such cultural nationalists as an essential part of formulating a mythos of what Australia is that harks back to its earliest days of settlement as a unique southern continent. It was a matter of particular interest to the Jindyworobaks, who had an informal association with Australia First. Introducing women into the workplace and away from child-bearing under the name of “feminism” is attacked as leading to the decline in the birth-rate as well as undermining the wage standard. Much of the rest of the manifesto is an attack the on democratic and parliamentary system. Interestingly, in this light, despite Stephensen’s aversion to British and other outside influence, he upheld hereditary monarchy rather than the idea of a republic with an elected head of state. Stephensen desired a government by statesmen with firm, long-term principles, as opposed to short-term vote pandering by political parties that leads to compromise and demagoguery rather than the sometimes harsh policies required for survival. Despite a specifically Australian nationalism, monarchy could reasonably be seen as the best form of government suited to the idea of “permanence” rather than that petty political transience. The organic social order had existed until the French and American Revolutions. Stephensen explains how these upheavals undermined the traditional social order with “democratic sectionalism,” and “an alleged equality inspired by the thoughts of J. J. Rousseau,” the Swiss rationalist philosopher. The result, under the facade of democracy and equality, has been not to empower “the people,” but to empower industrial and financial interests which are able to use democracy to undermine any authority and power. However, Corporatism enables the social organism to function as “an integral whole” subjecting sectional interests, whether class or party, to the interests of the community, like the cells of a biological organism that all function for the common good of the whole organism. 44. For industrial development; against speculation. 45. For competition; against monopoly. 46. For private ownership; against government encroachment. 47. For conservative banking practice; against inflation. 48. For less taxation; against greater taxation. 49. For reduction of debt; against increase of debt. 50. For world trade; against restricted trade. Stephensen compares the manner by which a small number of Jews are able to wield immense influence through a superior close-knit communal organization to the manner by which communist cells were able to insinuate themselves into institutions and get their measures adopted by an unsuspecting and largely lethargic majority. The “too-zealous propagandists of the Jewish Cause” in Australia had done the Jews a disservice by drawing attention to the Jews as a distinct community, for Anti-Semitism is a reaction to aggressive Pro-Semitism and neither exists unless a nation is in a pathological state. Should Jews forego their Jewishness and fully integrate and intermarry there would be no Jewish problem. That they do not do so is their choice, and Stephensen is convinced that they will never forsake their Jewishness, so the Jewish problem will remain. “Here then we are faced with a defiance by Jews of the fundamental principle of Fused-European Homogeneity which it is the basic aim of Australian national policy to establish and maintain. They claim the right not only to settle here but to maintain themselves in perpetuity, as a self-segregated minority, of different and distinct racial stock from the rest of the Australian community.” It is, as he points out, a matter of perspective. As a non-Jew in any conflict of interest between Jew and Gentile he would instinctively side with his own. Stephensen’s loyalty was to Australia, and a large migration of Jewish refugees from Europe would undermine the Australia that he wished to see developing as a nation, culture, and people on its own account. Such sentiments were regarded as treasonous by the authorities whose Government had tied Australia to British imperial and American, i.e., plutocratic, interests. Additionally, several individuals and groups had gained the attention of military intelligence as possible collaborators in the event of a Japanese invasion. Some of these were loosely connected to the Australia First Movement. “Enemy aliens,” including those who were anti-fascist, were being interned. Sixteen supporters of the Australia First movement, whom the press described as a “spy ring,” including Stephensen and his brother Eric, were detained under Regulation 26 at Liverpool internment camp in March 1942. Police occupied the Publicist office. The poet and author Ian Mudie, an executive member of the movement, although questioned, was not interned, although he was to comment that he must be either as “guilty” or “innocent” as those who were. Muirden comments: “Strangely, the Publicist was not banned, and the movement was not officially proscribed.” However, this was unnecessary, and perhaps could be regarded as being hypocritical, since Stephensen, and the other two proprietors of The Publicist were interned with other key members. The Bulletin remained strongly opposed to the internments, and made much of one of the internees being “an Old Digger.” The latter, Martin Watts, a holder of the Military Medal from World War I, and several others were conditionally released after several months. However, Watts’ job was gone, and he died several weeks later of bronchial pneumonia, exacerbated by his internment. Transferred to Loveday Camp, then to Tatura Camp, Stephensen spent three-and-a-half years interned. After the war, several ex-internees continued to campaign for exoneration, and two issued a reprint of the 1942 issues of the Publicist to provide a “durable historical record” that would show their loyalty and patriotism. Ian Mudie had been keen to see Australia First revived. However, Stephensen was optimistic regarding the development of Australia’s national consciousness and believed the aims of the movement were being realized. The imperial connection was dissipating, and there was a growing interest in Australian culture. For the first decade after the war Stephensen was mainly involved in assisting Australian writers, principally Frank Clune. By 1959 Stephensen had sufficiently re-established his literary reputation to be asked to undertake a Commonwealth Literary Fund lecture tour of South Australia with Mudie. The lectures were published as Nationalism in Australian Literature. Other such lectures followed in Queensland in 1961. His continuing theme of an Australian national culture by this time was meeting with wider support. Stephensen’s literary output continued at an impressive rate, and included The Viking of Van Diemen’s Land, The Cape Horn Breed, Sail Ho!, Sydney Sails, The Pirates of the Brig Cyprus, and The History and Description of Sydney Harbour. His seminal Foundations of Culture in Australia was republished in 1986. Craig Munro, Inky Stephensen: Wild Man of Letters (University of Queensland Press, 1992). Bruce Muirden remarks that, “Miles Franklin has noted, with justice, that Stephensen’s key critical work, The Foundations of Culture in Australia, is ‘more assiduously consulted than acknowledged.’” Muirden, The Puzzled Patriots: The Story of the Australia First Movement (Melbourne: Melbourne University Press, 1968), pp. 15-16. The Puzzled Patriots, p. 17. The Puzzled Patriots, pp. 17-18. P. R. Stephensen, “Bakunin,” ca. 1928. Stephensen translated and published Nietzsche’s The Antichrist in 1929. Friedrich Nietzsche, Thus Spoke Zarathustra (Harmondsworth: Penguin Books, 1969), “Of Higher Man,” pp. 296-306. Nietzsche would not have applauded the revolutionary mob under any circumstance, although it is easy to see what Stephensen could perceive in Bakunin in Nietzschean terms, and the revolutionary desire to destroy the bourgeois order: “For today the petty people have become lord and master: they all preach submission and acquiescence and prudence and diligence and consideration and the long et cetera of petty virtues” (Thus Spoke Zarathustra, p. 298). Stephensen, “Holy Smoke: An Essay in Religious Experience,” ca. 1928. The Puzzled Patriots, p. 21. The Puzzled Patriots, p. 22. Sandy Robertson, The Aleister Crowley Scrapbook (London: W. Foulsham, 1988), p. 7. Israel Regardie, “Introduction,” 1969; P. R. Stephensen, The Confessions of Aleister Crowley, 1930 (Phoenix, Arizona: Falcon Press, 1983). Stephensen, The Confessions of Aleister Crowley, pp. 13-14. Stephensen asked that Crowley be judged by his poetry and prose and not by his notorious character. The Aleister Crowley Scrapbook, p. 19. The Puzzled Patriots, p. 24. The Puzzled Patriots, p. 25. The Puzzled Patriots, p. 28. The Puzzled Patriots, p. 36. The Puzzled Patriots, p. 37. The Puzzled Patriots, p. 39. Founder of the cultural-nationalist Jindyworobak movement in 1938, upon which Stephensen’s Foundations had had a seminal influence, although Ingamells thought that Stephensen conceded too much to British influence on the development of Australian identity. The Puzzled Patriots, p. 51. Stephensen, The Publicist, July 1939. The Puzzled Patriots, pp. 42-43. The Puzzled Patriots, p. 49. The Puzzled Patriots, p. 50. The New Guard was established by Eric Campbell in 1931, primarily to oppose communism and specifically the New South Wales Labour Government of Jack Lang, reaching a membership of 50,000. Ironically, it was Lang, in the tradition of Old Labour, who was staunchly anti-communist, a die-hard advocate of “White Australia,” and of particular significance, advocated suspension of interest payments to British bondholders, interest on Government bondholdings to be reduced from 6% to 3%, and the issue of state credit based on the “goods standard,” not the “gold standard.” Keith Amos, The New Guard Movement 1931–1935 (Melbourne University Press, 1976), p. 23. While The New Guard had the trappings of Fascism such as the Roman salute, Campbell did not consider Fascism as a doctrine until 1933 when he visited Mussolini. In hindsight, it could be contended that it was Lang who from the start was a thoroughly-grounded Australian Nationalist rather than the paramilitary Empire patriots who wished to defend British and Australian bondholders. Additionally, the “Lang Plan” was of more specifically nationalist orientation than the free trade economics of Stephensen. See also: Jack Lang, “White Australia Saved Australia,” I Remember (1956), Chapter 6. The Puzzled Patriots, p. 60. Mrs. Walsh was soon asked to withdraw from the movement because of her overly enthusiastic support for Japan. The Puzzled Patriots, p. 62. The Puzzled Patriots, pp. 66-68. The Puzzled Patriots, p. 69. The Puzzled Patriots, pp. 47-48. K. R .Bolton, “State Credit and Reconstruction: The First New Zealand Labour Government,” Journal for the Study of Social Economics, Vol. 38, No. 1, February 2011. K. R. Bolton, Building the New Babel: Multiculturalism and the New World Order (Paraparaumu, New Zealand: Renaissance Press), pp. 8-15. William Lane, The Boomerang: A Live Newspaper Born of the Soil, March 17, 1888. What one might whimsically call the “collaborationist conspiracy” in Australia centered around Government agent “Hardt,” and a couple of individuals who were not aligned to Australia First; Nancy Krakouer (of Jewish descent), Laurence Bullock, and E C Quicke, harmless dreamers, who thought they might form a collaborationist government in the event of a Japanese invasion. Authorities were not able to establish any association between these and Australia First. The Puzzled Patriots, p. 144. The Puzzled Patriots, p. 94. The Puzzled Patriots, p. 110. The Puzzled Patriots, p. 113. The Puzzled Patriots, p. 113. His wife Dora, who was part Jewish, was to maintain lifelong activity in the Australian “Right.” As late as 1978 she was writing for an Australian nationalist periodical. Dora Watts, “The Murder of a Nation,” Advance!, No. 4, January-February 1978, p. 7. The Puzzled Patriots, p. 122. The Puzzled Patriots, p. 128. With Frank Clune, Sydney: Angus and Robertson, 1954. The Puzzled Patriots, p. 177. Stephensen, Nationalism in Australian Literature (Adelaide: Commonwealth Literary Fund Lecture, 1959). The Puzzled Patriots, p. 178. The Viking of Van Diemen’s Land (Sydney: Angus & Robertson, 1954). The Cape Horn Breed, with William H. S. Jones (London: Andrew Melrose, 1956). Sail Ho!, with Sir James Bisset (London: Rupert Hart-Davis, 1961) and several other books with Sir James. Sydney Sails: The Story of the Royal Sydney Yacht Squadron’s First 100 years (Sydney: Angus and Robertson, 1962). The Pirates of the Brig Cyprus, with Frank Clune (London: Rupert Hart-Davis, 1962). The History and Description of Sydney Harbour, with Brian Kennedy (Adelaide: Rigby, 1966). Foundations of Culture in Australia (Sydney: George Allen and Unwin, 1986). The Puzzled Patriots, p. 180. Published: November 20, 2011 | This entry was posted in North American New Right and tagged Aleister Crowley, articles, Australia, Australia First, Australian literature, book excerpts, Friedrich Nietzsche, Kerry Bolton, literature, North American New Right, P. R. Stephensen, reprints, the Jewish question, the racially conscious left, White Australia, white nationalism. Both comments and trackbacks are currently closed. While I look forward to reading Bolton’s book I found that reading him I have an aversion to those with the mentality of “I destroy and I build” for they never seem to build something comparable with what they have destroyed. These days any rebuilding is always a step back to the architecture of the kindergarten. However, I do agree with Stephenson that the “world dies” unless the “Bakunin-principle” re-emerges,but sadly if so many leaders hadn’t walked on the edge of precipices we would not be in this mess. As some wit at C-C had earlier said, “We are not going to vote our way out of this mess” so the Bakunin principle of Safety-Last is staring us in the face. It is not a matter of revolution but rather mere survival. Hyperlink the link in note 8.